Visual Arts was one of the only subjects through out my highschool studies that i actually enjoyed, apart from English. One of my favourite artist is of course the well known Pop Artist Jeff Koons. 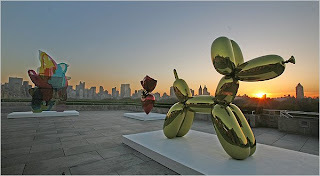 He is renowned for his public sculptures and installations, one in particular "Puppy", (shown at Rockefeller Center and permanently installed at the Guggenheim Bilbao) and his discovery of "The New". Towards the latter part of my studies was when i actually studied this artist in depth, and my love of his quirky, unique works is forever growing stronger.